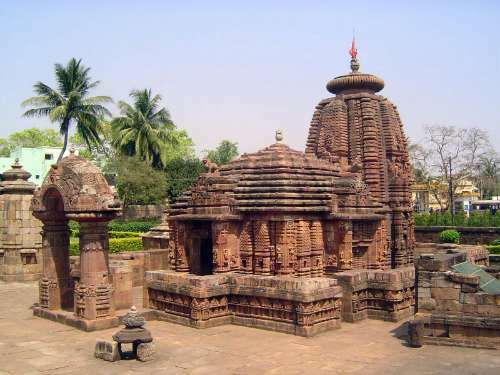 During the British period, the capital of Orissa was Cuttack; with Independence, the capital was moved to the old temple town of Bhubaneshwar, some 15 miles to the south. 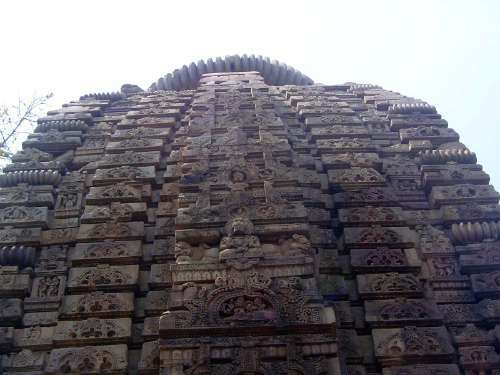 A German planner, Otto Konigsberger, laid out a new Bhubaneshwar adjoining the old one, and the result, though on a smaller scale, is as sharp a contrast as the one between Mughal Delhi and British New Delhi. We focus here on the older town, with a few pictures of the newer one and its shopping delights. 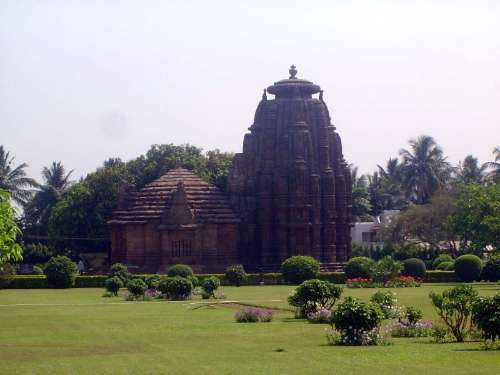 The temples of Bhubaneshwar belong to the northern or nagara style of Indian temples, which, radically unlike those of South India, have neither columns nor monumental gateways. 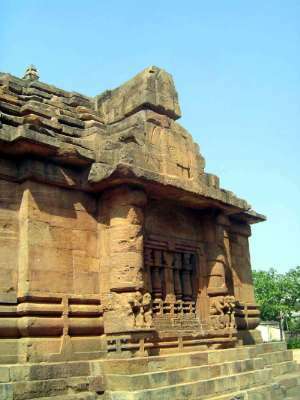 Instead, the two key elements of the temples are a covered porch (in India broadly, this is the mandapa but it is locally called the jagmohana) and a sanctuary (broadly, the shikhara but locally the rekha). 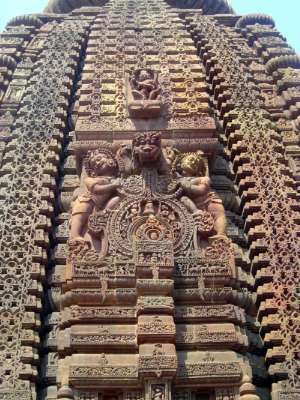 Both are on view here in Bhubaneshwar's Parashurameshvara Temple. 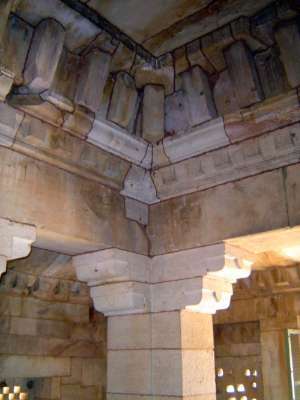 Though the porch roof was dismantled and reassembled about 1900, the temple was built about 700 A.D. and shows an early stage in the local evolution of temples. The porch, for example, rests on the ground, not on an elevated platform, and it is rectangular, not square. 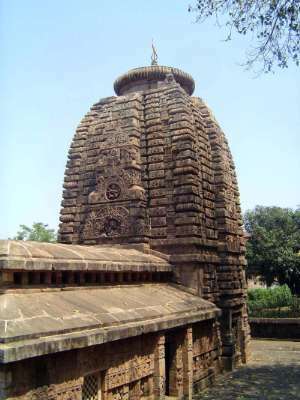 The most dramatic difference between this temple and later ones is the porch's simple roof, which in later temples evolves into a much more complex form. As is so often the case, the interior of both the porch and sanctuary is extremely plain. Here, the sanctuary. And here the interior of the porch. The exterior is a different story. 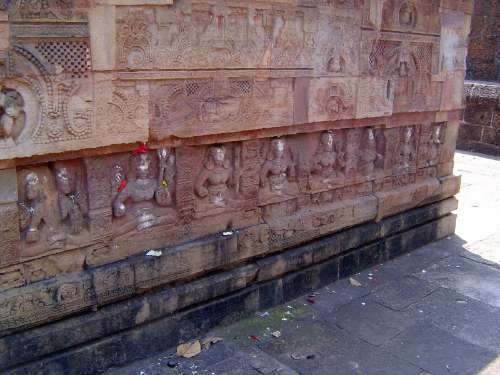 Each of the sanctuary walls is devoted to a different deity. 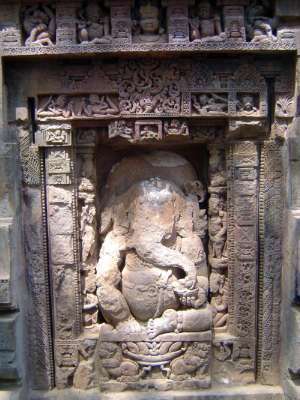 On the south, here on the right, the subject is Ganesha, occupying the central spot at the base of the tower. 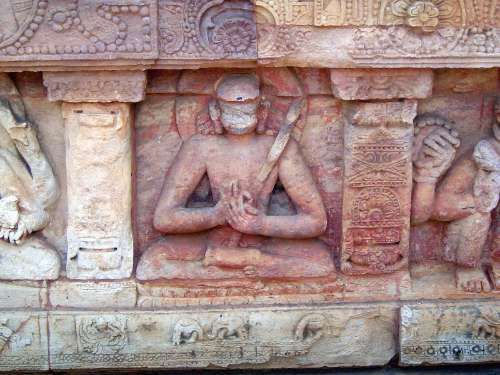 The image is sadly eroded or defaced. 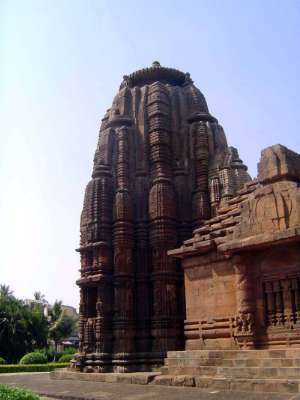 The tower is convex and composed of projecting and recessed blocks whose pattern in later temples becomes still more complex. 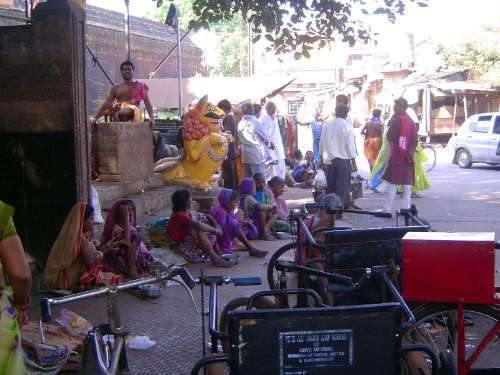 On the west side, the place of honor goes to Lakulisa, an avatar of Shiva who looks a great deal like the Buddha. 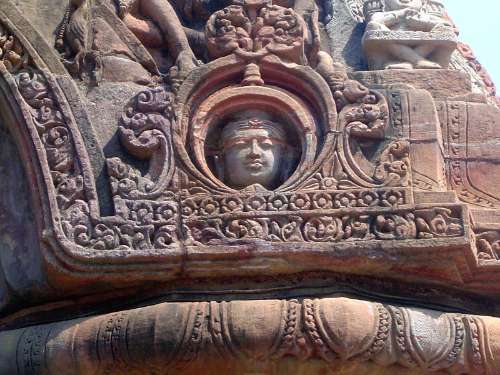 He appears under a decorative arch or chandrashala, called gavaksa when applied to a temple. A closer look at Lakulisa. You can see why he is called "the Lord with a Club." Before deification, Lakulisa was a reformer of the Pasupata Sect, no longer extant. 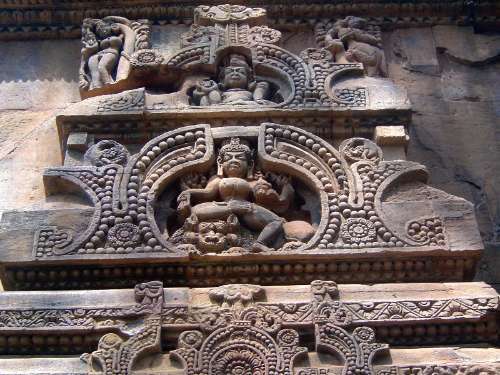 Similarly sheltered by an arch, Shiva dances on another side of the sanctuary over the demon Ravana. 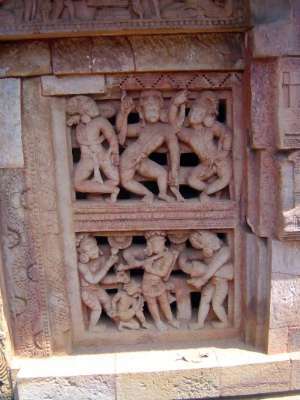 A window in the porch has a grill carved into dancers and musicians. 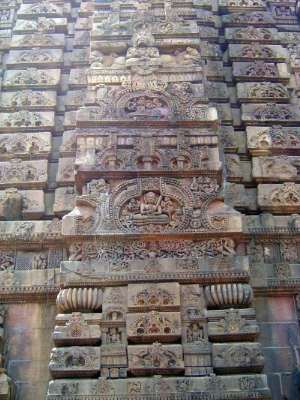 The exterior of the porch is also lined with images. Lakulisa, again looking like the Buddha. 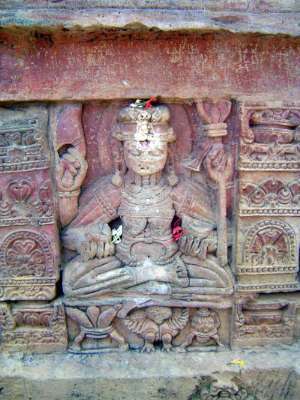 Less friendly: Chamunda, a terrifying aspect of Durga. 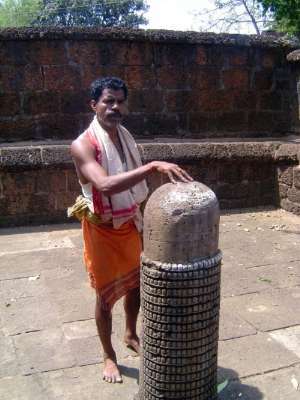 Standing next to the porch is this sahasra, a lingam carrying a thousand miniature lingams. 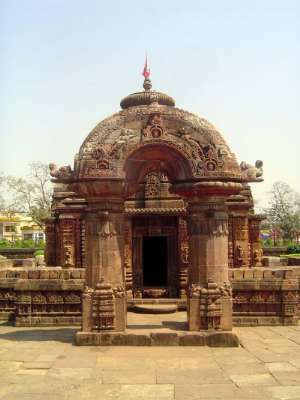 It's only a short walk to this "gem of Orissan architecture," as Fergusson called it (vol. 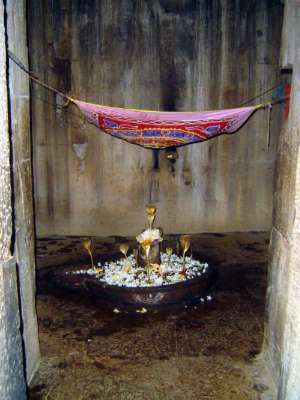 2, p. 97). 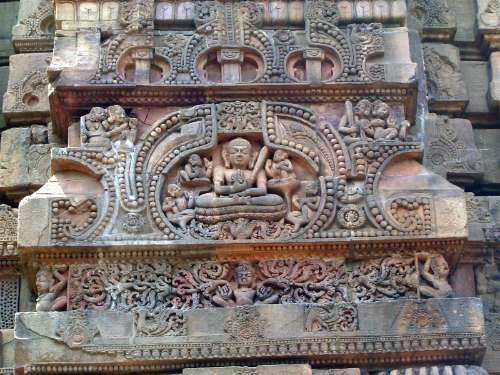 It's the Mukteshvara Temple from the late 10th century, or about three centuries later than the Parashurameshvara Temple in the previous pictures. The tower is little different, but the porch is greatly changed, especially with the appearance of 11 stacked and corbelled roof layers or pidhas. 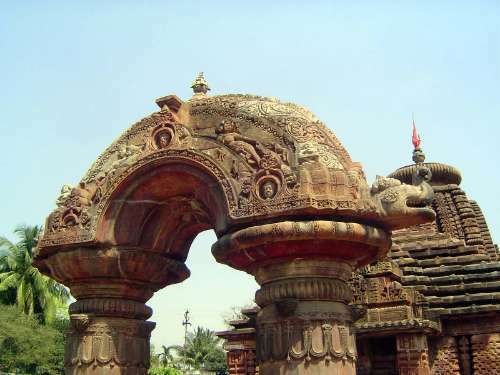 The freestanding entrance arch or torana emphasizes the act of entering sacred space. Still closer: a figure in a window. The meaning is that the gods within keep watch. 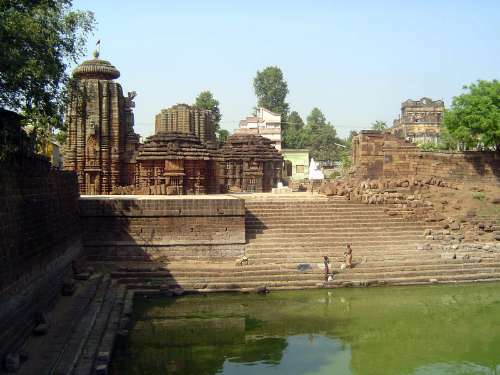 Behind the temple is this pool. 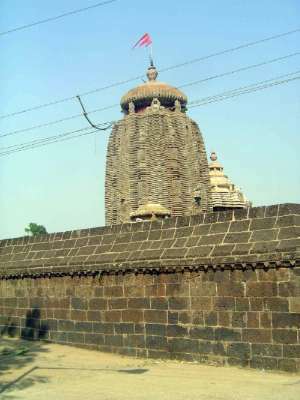 Atop the tower is an urn, or kalasha, carrying the nectar of immortality, or amrita. The grooved disc below the urn is called the amalaka, which is also the name of the Indian gooseberry, a plant much used in traditional Indian medicine and worshipped as a sacred tree. 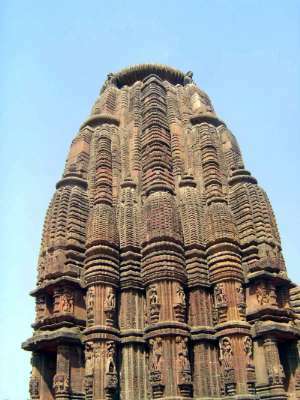 Carved from a single stone, it also helps protect the temple from water damage. The masonry has no mortar. Guards protect the deity peering from the tiny window. 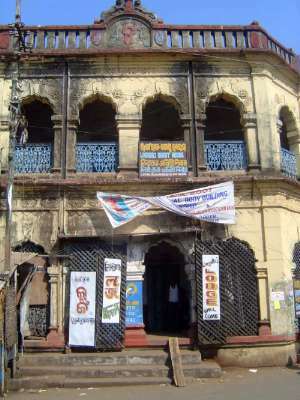 A third temple, the Rajarani Temple. It's from the 11th century, and from the placement of its projections the tower appears cylindrical, not square. 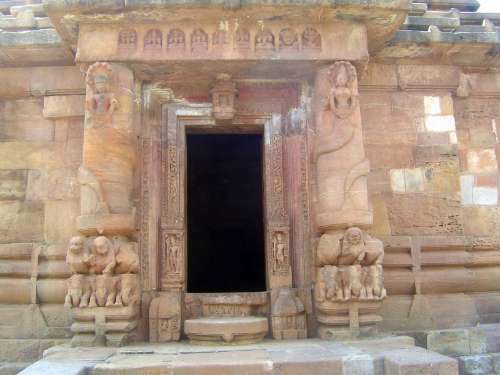 The entrance is guarded by female nagas, with a human head and snake body. They are themselves guarded by seven cobras, whose hoods flare from behind. 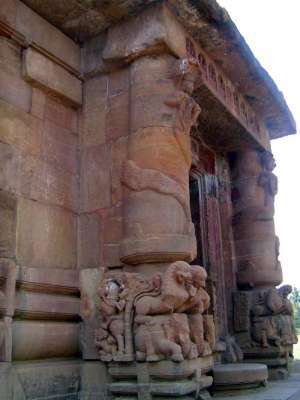 At the base of the columns, lions subdue elephants. The projections, or rathas, on the tower are miniature versions of that tower. 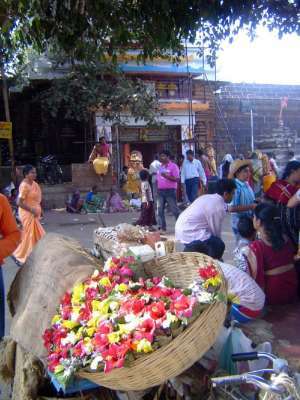 At their base are apsaras--nymphs in one common translation--holding boughs overhead. Once again: no mortar, just well-fitted blocks. The porch is comparatively barren, though a stone-grilled window has been placed in the wall. 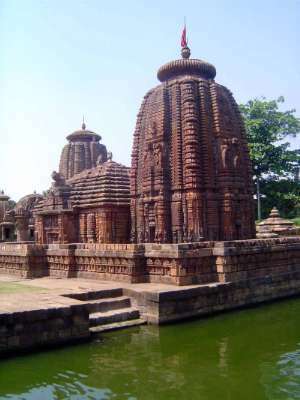 All the temples in the previous pictures are now under the care of the Archaeological Survey of India. 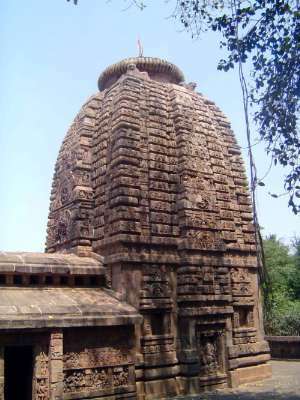 Bhubaneshwar's most important functioning temple, Lingaraja, is not. 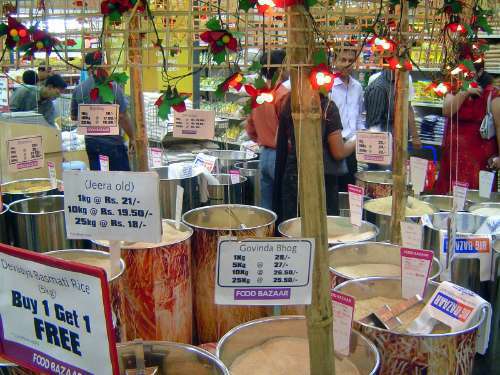 It's also closed to non-Hindus. Here's a peep at the entrance. 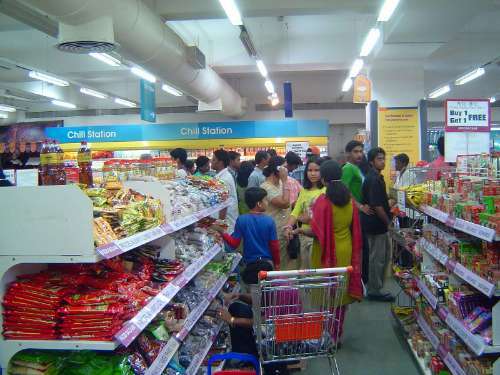 A line of women waiting. 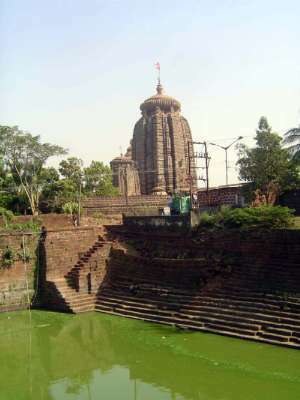 A view from Paapnashini Kund, or "Sin-destroying Pond". The pond has its own temple. 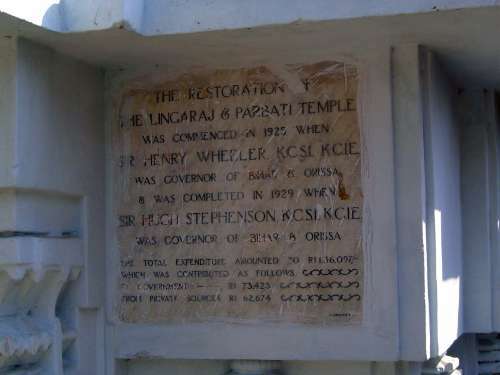 Restoration of Lingaraja had help from the British government. 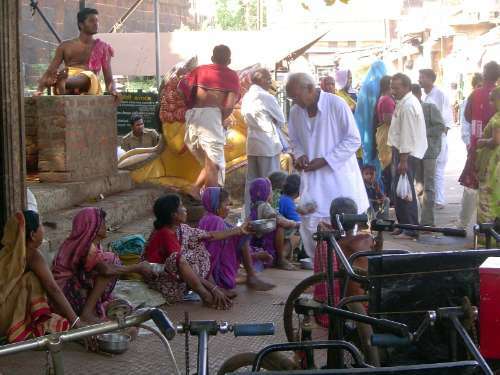 Not this this will help non-Hindus who want to take a closer look. 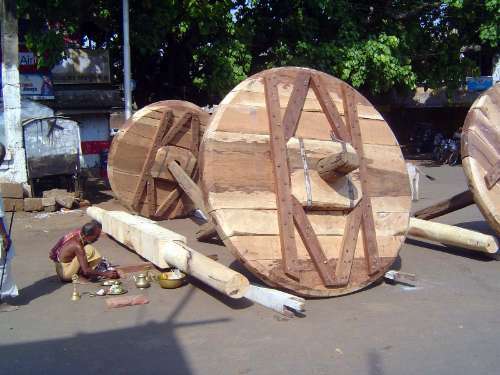 Outside the temple, wheels are built for a temple cart, or ratha. 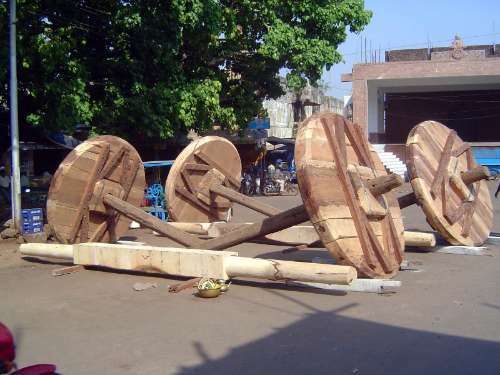 More than carpenters are needed to put it together correctly. 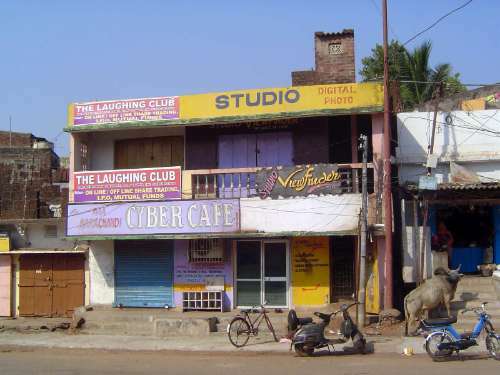 Not the best hotel in town, but close to the temple. 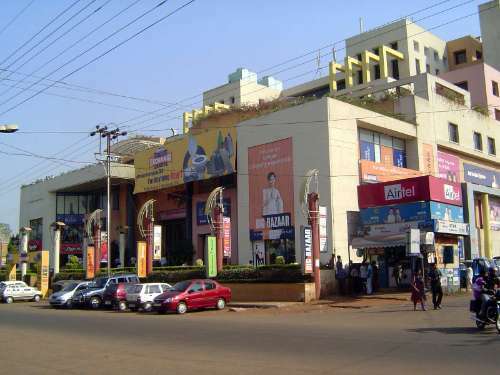 The newer part of Bhubaneshwar has shared in the rush to build shopping malls across India. Go in? 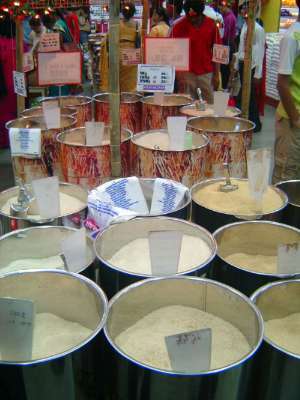 A wide selection of rices. Buy 1, get 1 free. All the major signs are in English.